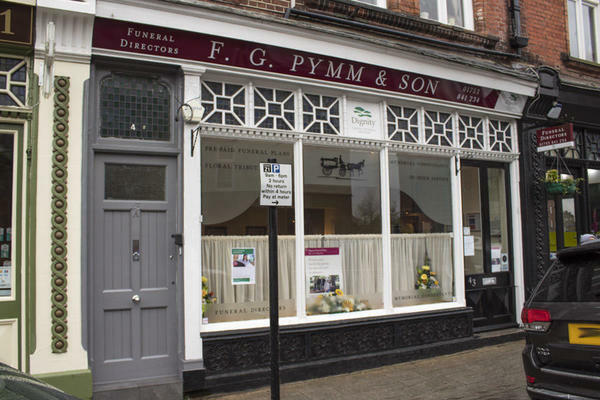 F G Pymm & Son Funeral Directors in Windsor serves local families and those in the wider Berkshire community, offering professional funeral care whenever it is needed. With our name having been associated with funerals since 1880, we have the expertise to give your loved one a dignified farewell. You will be treated with compassion and respect while in our care, receiving the full support of our team of funeral directors at all times. Throughout the arrangement process you can rely on our knowledge and guidance to help to ease some of the uncertainty you may be experiencing. Regardless of the type of funeral you choose, be it a religious or non-religious service, something traditional or something more contemporary, you can tailor it as much or as little as you want to own preferences. Whatever you decide, we will ensure it gives you, your family and friends the opportunity to remember somebody special in a heartfelt and personal way. Our Windsor funeral home was opened in 2012 and offers the highest standard of facilities, including a chapel of rest where you can spend some time with your loved one prior to the day of the funeral. We are located on St Leonards Road, which makes us not only accessible to the town, but also our neighbours in Berkshire, such as Eton, Datchet, Holypoint and Old Windsor. The team at our Windsor funeral directors will be available to provide assistance when you need us. In the first instance, you can speak to one of our caring advisors, who will be ready to provide a sympathetic ear and offer advice. To arrange your loved one’s funeral, call us today. Call us today on 01753 841234 to talk through your personal requirements. At F G Pymm & Son Funeral Directors, we understand how special life is with those that you love. For us, every funeral is unique and personal. We have a service to fulfil every wish, with every detail carried out with the same uncompromising quality of care. From a traditional service, to a colourful woodland burial, your options are limitless with our Full Service Funeral. If you have a little more flexibility when it comes to arrangements, then we can provide a Simple Funeral for a lower cost. There is pay & display parking on the street outside our funeral home. We are located on the left side of St Leonards Road, just past Albany Road in Windsor. Our staff are available 24 hours a day on 01753 841234 if you require our services outside of these hours. From the outset they were professional and courteous when they dealt with us. Nothing was too much trouble and considering we were some distance away it wasn’t easy. Thank you so very much.